I had an email last Sunday from Christine Monkton (one of our first Digital Photography Exposed clients) asking how she should begin with using photographic reflectors for portraiture. Great idea for a photography tip ­- so thanks Christine, this one’s for you...(and for more tips about bouncing light, check out the Flash video in our Photography Videos section). You can make a photographic reflector from just about anything that’ll reflect light. I frequently use the large white envelopes my lab (ProAm imaging) sends my prints back in, as well as a purpose-built Lastolite. My first photography reflector was made from a two foot square piece of sand blasted sheet metal. I painted one side silver and the other white, then drilled a hole in the middle to attach it to a tripod head so I could still use it even when I didn’t have anyone to hold it for me. Just to prove you don’t have to use specialist kit ­- in this tip Lorna’s demonstrating how she uses one of the lab’s envelopes to push a bit of light back into her friend Sian’s face. 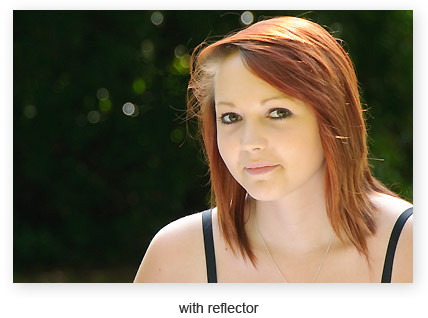 Look how much brighter the image is in ‘reflectored’ version compared to the one where no reflector was used at all. Sian's high cheek bones are more defined, her eye's are clear and sparkling and everything about it is just - well, smoother somehow. In the first picture there's a deep shadow at Sian's collar bones which is softened and lifted by the light being reflected back in by Lorna with something as simple as an envelope. All photography depends on light. The better the quality of light - the better the picture. Be subtle, you don’t want your image to look over done. When correctly used the image looks bright but natural. For women - position the reflector in front and slightly below to add sparkle to the eyes and lift shadows under the nose and chin. For men - a reflector to the side can bring out the facial contours making them look extra rugged and manly. On a dull day try using a gold coloured photographic reflector to improve skin tones. If you’re back lighting your sitter (as I am in these demonstrations) a reflector pushes light back and balances the direct sunlight coming from behind your sitter. Use a window that faces away from the sun as your light source ­ with a reflector placed opposite (the side away from the window) to lift the shadows on the dark side. Photographic reflectors aren’t just for portraiture ­ try using one for still life or macro to bounce a bit more directional light into your pictures. If making your own reflector don’t make it too shiny (ie gloss paint) because the result will be too strong and harsh. The whole point is to create soft directional light. Matt paint or a slightly rough surface shatter the rays and soften the light. 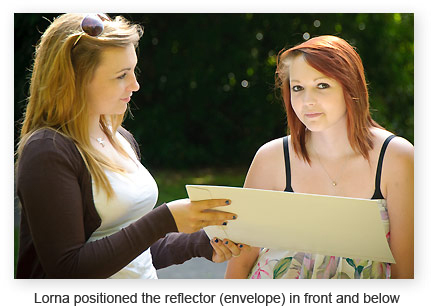 Photographic reflectors are handy tools which when used appropriately will give your pictures an ‘edge’. They’re simple to use and if you’re making your own they’re very cheap - but like everything else in life you need to practise and get some experience before you’ll master it. So as homework I suggest you find someone who enjoys having their photo taken - or a shop window dummy which works just as well for practising on. Then grab your camera and a reflector and get practising. It's important to experiment with different angles, turn the reflector back and fourth to see what happens. I can tell you things till I'm blue in the face - but what always makes the difference is getting into action and having a go yourself. If you’d like more help with your photography check out the rest of our photography tips ­ or better still invest in one of our photography course downloads. For less than the cost of an evening in the pub you could be improving your photos forever. 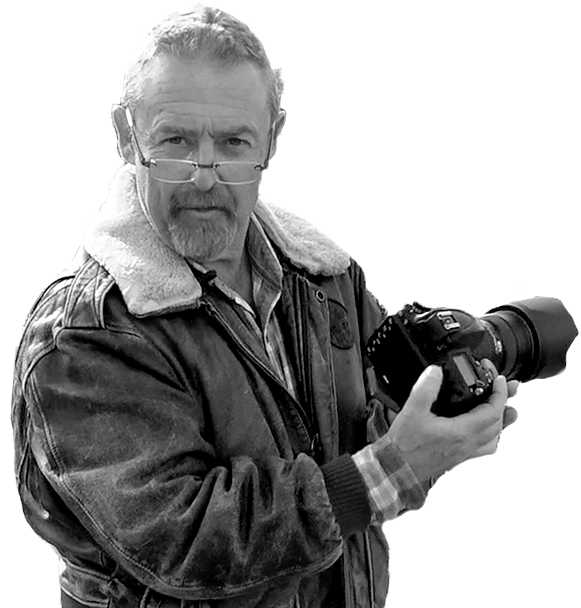 Or why not come on a One to One photography course with me? It’s just the two of us working on whatever you feel you need to. If you’d like to call me, ask questions and / or make a booking I’m on 01590 670224. Happy Shooting till next time.